From left, Valley Beit Midrash President and Dean Dr. Rabbi Dr. Shmuly Yanklowitz, pastor Ramon Madrid and Arizona Jews for Justice Campaign Organizer Eddie Chavez Calderon. A simple and effective way for donors to support migrant families is to purchase care boxes through Amazon via a registry list. Eddie Chavez Calderon can’t imagine ignoring the thousands of migrant families ICE has released from their detention facilities. The new campaign organizer for Arizona Jews for Justice (AJJ) believes he has both a humanitarian responsibility to provide for these asylum seekers and a personal need to help them as a DACA recipient. Chavez Calderon was born in Mexico and immigrated to the United States at the age of 4. Chavez Calderon, who is not Jewish, joined Valley Beit Midrash’s (VBM) social justice group in December. In little more than a month, he has been successful in mobilizing a large response in the Jewish community through the AJJ’s Facebook page. More than 800 care packages delivered through Amazon have been donated to migrant families, in addition to clothes, medical supplies and food that were donated as well. In early October, as detention facilities became overcrowded, ICE began releasing migrant families. ICE spokeswoman Yasmeen Pits O’Keefe said that the volume of immigrants who have come to the border have limited the government’s ability to hold them without violating court-imposed restrictions on how long minors can remain in ICE and U.S. Border Patrol custody. But leaving a detention facility is not the end to a migrant family’s problems. Chavez Calderon says that many of these families are unable to get basics such as clothing and food. Many of these migrant families were released in Phoenix without much guidance on where to go or what to do. They subsequently looked for sanctuary and support in churches and other religious centers. But the sheer volume of families overwhelmed many churches. Rabbi Dr. Shmuly Yanklowitz, AJJ founder and president and dean of VBM, has run donation drives for migrant families since October. Through a partnership with Uri L’Tzedek, the Orthodox Social Justice movement, they have been receiving donations from around the nation. 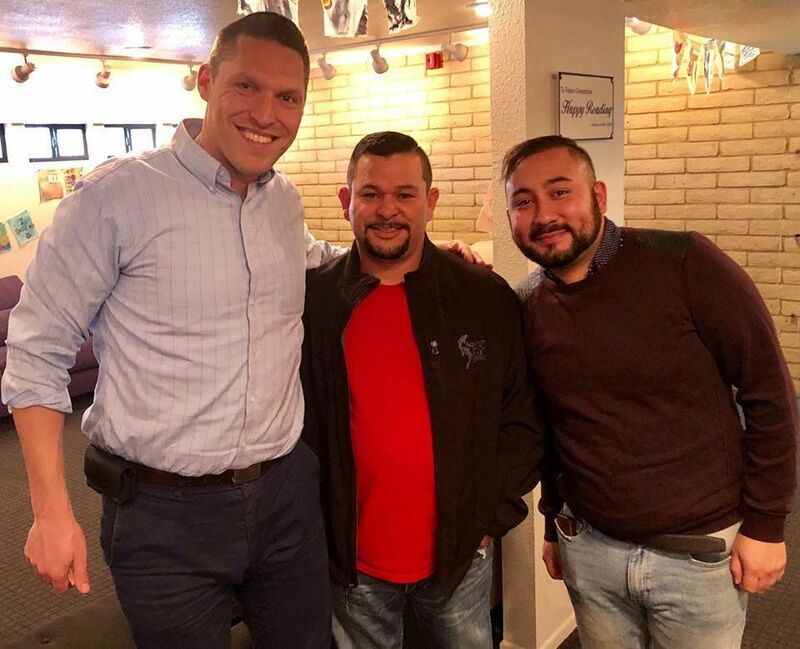 With the addition of Chavez Calderon’s assertive social media campaign in December, Yanklowitz has been impressed by the amount of support AJJ has received. On a practical level, Yanklowitz said Facebook makes it simple for people to donate to charitable causes. Yanklowitz started AJJ after hearing reports that the city of Phoenix was moving its homeless population away from the downtown area for the 2015 Super Bowl. As a way to help those in need, Yanklowitz posted a call-out on Facebook for foam mats that might help homeless men and women endure the conditions. According to its website, AJJ is the first and only Jewish social justice organization in Arizona. Yanklowitz and Chavez Calderon said the response they’ve seen from the local Jewish community toward new immigrants has been astounding. However, there is still more work that needs to be done. Despite the current divisive political climate around a topic like immigration, Yanklowitz hopes that people will see the positive effects of their efforts. Yanklowitz wants people to look back through the history of the Jewish people and see the current crisis with migrant families through that lens. He said that for millennia, Jewish communities have been among the most victimized and persecuted.